The Shrine of Remembrance, Victoria's principal war memorial, was constructed between 1927 and 1934 on a prominent elevated site south of the city, on a north-south axis with Swanston Street and St Kilda Road. 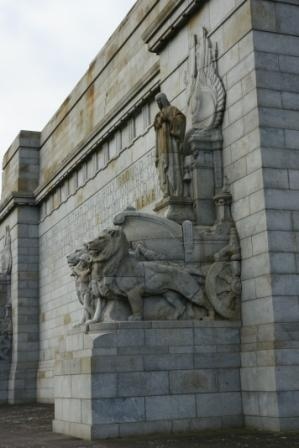 A competition for the design of the World War One memorial was held in 1923, with the winning design by returned servicemen, Philip B. Hudson and James H. Wardrop, incorporating a distinctive interior space. Their monumental, classically conceived design, set on a series of elevated terraces within a formally planned landscape, caused considerable controversy in the press, however was finally adopted with some modifications, and the foundation stone was laid on Armistice Day 1927. Builders for the Shrine were Vaughan and Lodge, and architect Kingsley Ussher joined the architects' practice in 1929. After completion, the building was dedicated on 11 November 1934 by the Duke of Gloucester, at a ceremony attended by about 300,000 people. Hudson and Wardrop's design for the Shrine is highly symmetrical with strong axial approaches from all directions. It drew on classical Greek sources in both form and detail and incorporated refinements to correct optical illusions, as undertaken in Classical Greece. The main form was based on the Mausoleum of Halicarnassos (353 B.C.) with a stepped reinforced concrete, pyramidal roof (originally clad externally in granite but reclad in copper sheeting in 1969) rising above a monumental cubic base. Octastyle Doric porticoes were applied to the north and south elevations, based on the Parthenon (447-432 B.C. ), and a large finial, based on the Choragic Monument of Lysicrates, Athens, was included in the final design. Together these three sources combine to produce a building based symbolically on a tomb, temple and monument. The building is planned around a central sanctuary with surrounding ambulatory, a crypt below and two balcony levels above. The sanctuary receives light from a skylight in the centre of the distinctive stepped high ceiling and a feature of the space is the ray of light designed to fall across the sunken Rock of Remembrance at 11am on Remembrance Day. The perimeter ambulatory contains ensigns and books recording the names of all 114,000 Victorian servicemen who enlisted and served in World War I. The superstructure of the building is clad externally with pale grey granite quarried from a Tynong quarry, which was opened to supply the stone for this building. Stone sculptures were integral to the design of the exterior and British sculptor Paul Montford was commissioned to undertake this work. These sculptures include large winged figures buttressing the exterior corners of the Shrine and friezes for the tympanum of the porticoes. The interior sanctuary is square in plan and symmetrical about both axes, and incorporates sandstone cladding, a marble tile floor, sixteen dark Buchan marble Ionic columns and twelve frieze panels, designed by young sculptor, Lyndon Dadswell. The crypt is also clad in sandstone and has a ruled concrete floor and decorated coffered concrete ceiling. It contains a bronze casket containing the names of Shrine fund contributors and copies of the original drawings. In 1968 a bronze sculpture, Father and Son by Ray Ewers, was installed in the centre of the floor. In 1949 a competition was held for the design of a World War II memorial. This was won by Ernest E. Milston with a design for a forecourt on the northern side of the Shrine, at a terrace level beneath the existing terraces. The forecourt, dedicated by the Queen in 1954, is designed in the form of a cross, and comprises an eternal flame and cenotaph on the western arm and three flagpoles on the eastern arm. The eternal flame is a brass bowl with gas-fired flame, surrounded by a low bronze rail fence and the most substantial of the three monuments, the cenotaph, is located behind this flame. The cenotaph consists of a basalt sculpture of six servicemen carrying the figure of a fallen comrade draped in an Australian flag, set high on a sandstone base. George Allen, the head of the sculpture department at R.M.I.T. 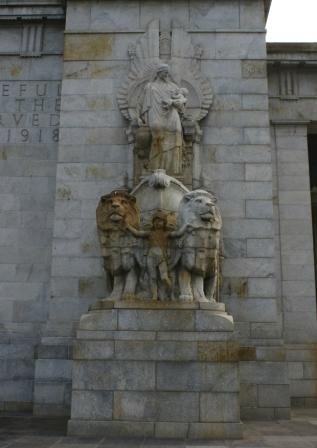 from 1933 to 1965, won a competition to design the statuary. Opposite these memorials, across the forecourt, are three simple flag poles of painted steel tube set in simple granite slabs, originally intended to be mounted in urn shaped sandstone bases. Other important elements have been incorporated into the Reserve since its inception, and a collection of these are located to the north east of the Shrine. The Gallipoli Memorial, which incorporates a bronze sculpture of The Man with his Donkey, was originally located outside the Reserve in 1935, however was relocated in 1967. Located nearby is a granite horse trough, relocated in 1986 from its original position also outside the Reserve. It was erected as an initiative of the Purple Cross Society in 1926, dedicated to the welfare of the horses sent to World War I. Also nearby are two life-sized bronze statues, Driver and Wipers, relocated from the State Library forecourt in 1998. The work of British sculptor Charles Jagger, these were originally purchased by the National Gallery of Victoria and installed after their arrival in Australia in 1937. Landscaping around the Shrine began in 1933, providing employment for 400-500 men during the Depression. The design features strong axial north-south and east-west roadways and diagonal paths leading to and from the memorial, with plantings playing an important and symbolic role at the Shrine Reserve. About 114 memorial trees were planted around the Shrine in 1934, some later replaced or removed. Specific areas of trees around the Shrine were allocated to the army, navy and air force, and exotic trees representing the Commonwealth countries were planted in the north east lawn in the 1950s. A lone pine (Turkish pine, Pinus brutia), one of a small number of early trees grown in Victoria from a cone brought back from Gallipoli and planted in 1933, is situated to the east of the Shrine. Formal 1934 plantings of Bhutan Cypress (Cupressus torulosa) remain along the northern approach from St Kilda Road and other formal plantings, including that lining the southern approach and Lombardy poplars encircling the base of the grassed mound, remain from later periods. The features of the Shrine's purpose, design and setting enhance its perception as a culturally significant place that provides opportunities for individual contemplation and reflection, for solemn group ceremonies and to educate the community about the events it commemorates. The significance of the Shrine is enhanced by its dominant presence in the urban environment and a clear vision to the place from outside the site. Views to and from the Shrine have been considered important since its construction. The importance of westward views from or across the forecourt has been increased as a consequence of the reconstruction of the forecourt to accommodate the World War II memorials and associated ceremonies. The Shrine of Remembrance, Melbourne is of historical, social, architectural and aesthetic significance to the State of Victoria. The Shrine of Remembrance is of historical significance as a memorial that demonstrates the devastating impact of World War One on the Australian nation. As the largest and most important war memorial in Victoria, it reflects the community's need for a public expression of grief and of commemoration for the sacrifice of life in war. A vast number of memorials, in many different forms, were constructed in the State from the end of World War I and into the 1920s. When the project was conceived, Melbourne was the seat of Federal Parliament and this resulted in the grandest memorial in Australia, at least until the Australian War Memorial was built in Canberra in 1941. 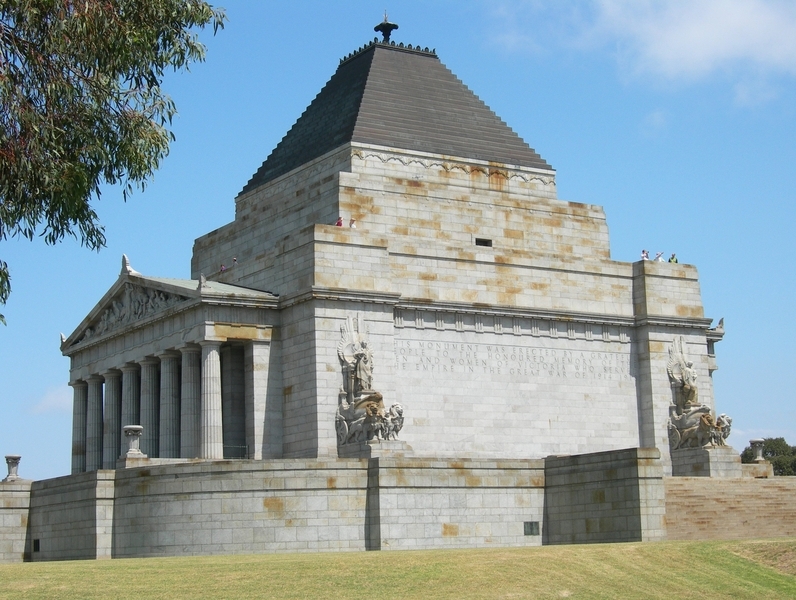 The Shrine of Remembrance is of historical significance due to its associations with a wide range of prominent individuals, including Sir John Monash, World War I veteran and engineer. Monash was instrumental in ensuring the Shrine project was executed. 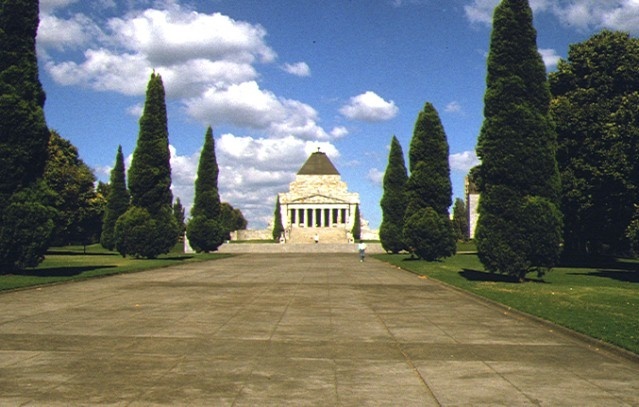 The Shrine of Remembrance is of historical significance due to the presence of the Lone Pine planted within the Shrine reserve. 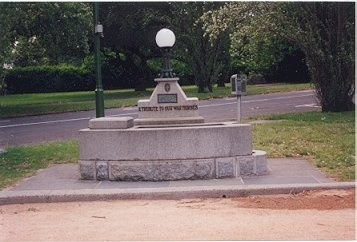 It is an early example and one of a small number planted in Victoria. 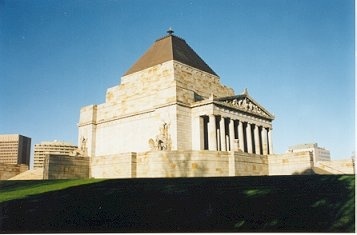 The Shrine of Remembrance is of social significance as the pre-eminent war memorial in the State. It has provided a focus for public events, a gathering place, and place for private reflection since its completion in 1934. The Shrine of Remembrance is of social significance as it reflects the rare level of public support given to this building. Despite the Depression, fundraising was very successful and a large crowd was present at the building's dedication. This highlights the magnitude of the importance of the memorial to the Australian public. The Shrine of Remembrance is of architectural significance as a large and imposing memorial building, one of seven erected in Australia between 1925 (Hobart) and 1941 (Canberra). It is a distinctive classically derived design which draws on symbolic Greek sources and incorporates carefully considered architectural refinements to correct optical illusions. 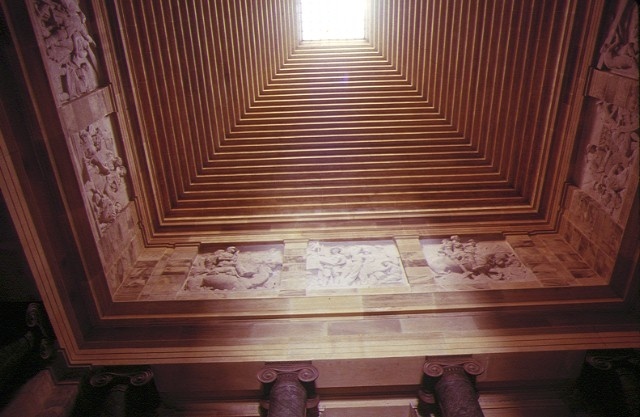 It is important for its prominent siting; strong axiality; the variety of materials used, which are all Australian in origin; the unusual emphasis placed on the interior space; the ray of light in the sanctuary and the array of major sculptural works, executed by a number of accomplished sculptors. The Shrine of Remembrance is of aesthetic significance for its design within the landscape, which ensures prominence and vistas from all directions. The array of war memorials and plantings, some of which are formal and others that relate symbolically to the wars of the twentieth century, add to this aesthetic landscape. It is significant as a place of ceremonial purpose, a place of separateness and grandeur which is heightened by its isolated and elevated siting on the edge of the city, and its highly formal and axial planning. 1. 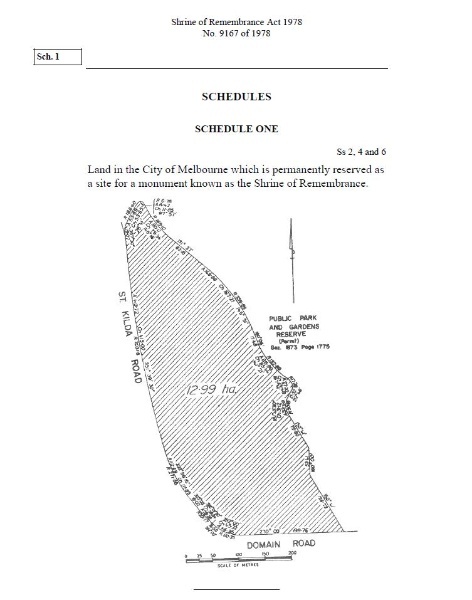 All the buildings and the whole of the land described in Schedule 1 of the Shrine of Remembrance Act 1978 (Act No. 9167). 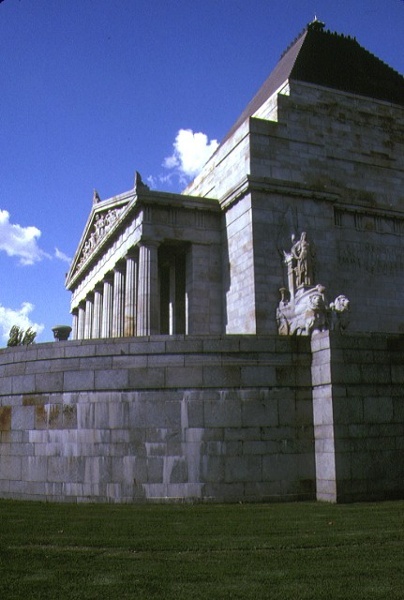 The Shrine of Remembrance, at 2-42 Domain Road, St Kilda Road, was completed in 1934 as a memorial to Victorian soldiers who served and to those who fell during the First World War. In 1949, a forecourt was added to commemorate the service of soldiers in the Second World War. 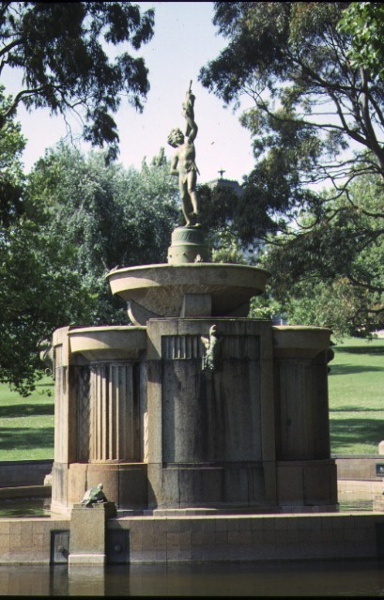 The site chosen for this great monument, a low hill on the axis of Swanston Street and embraced by a bend of St. Kilda Road, gives prominence and visibility from all directions and is crowned by the memorial building. 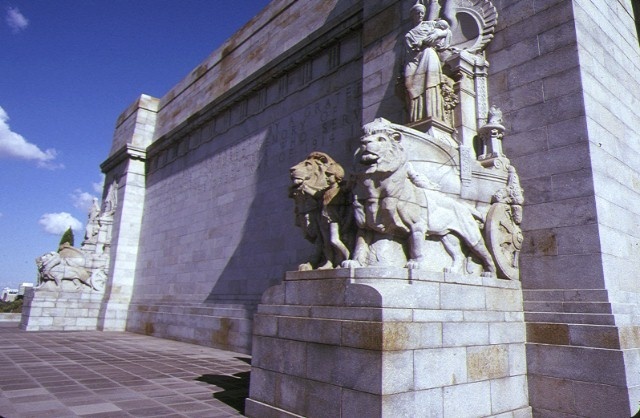 The Shrine of Remembrance site is home to a large number of monuments, memorials and commemorative spaces and artworks relating to Victorians' war service. These include the Gallery of Medals, the Buttresses and the Tympana, the Crypt, the Sanctuary, the Stone of Remembrance, the Ray of Light, the Frieze, the Ambulatory and Books of Remembrance, the Second World War Forecourt, the Eternal Flame, the Cenotaph, the Remembrance Garden Post 1945 Memorial, the Legacy Garden of Appreciation, the Man and His Donkey statue, the War Horses Memorial, the Cobbers Statue, the Lone Pine, Unit Plaques and Memorial Trees. Futher information can be found at www.shrine.org.au. Between 1914-1918, 116,000 Victorian citizens volunteered to serve overseas in the Navy and the Army. Casualties were heavy and 18,000 Victorians did not return to their homeland. Many thousands more were wounded or rendered unfit. 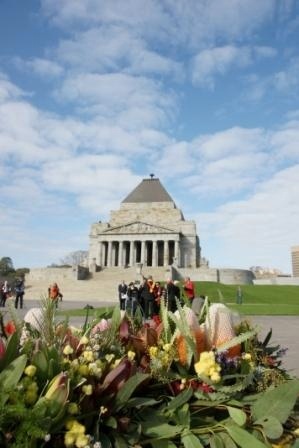 At a public meeting called by the Lord Mayor of Melbourne on August 4th 1921 a decision was made to build a permanent memorial. The State Government and the Melbourne City Council allocated large funds towards the objective. As a result of the support given by Service leaders, in August 1926 sufficient money was raised by public subscription and after May 1927, tenders were called to proceed with the selected design. The Legacy Clubs of Victoria played a leading part in achieving this objective. In addition, the school children of Victoria raised funds and their contribution is perpetuated in the statuary on the Western and Eastern faces of the Shrine, representing the virtues - Sacrifice, Patriotism, Justice, Peace and Goodwill. A competition for the design of the First World War memorial was held in 1923, with the winning design by returned servicemen, Philip B. Hudson and James H. Wardrop, incorporating a distinctive interior space. Their monumental, classically conceived design, set on a series of elevated terraces within a formally planned landscape, caused considerable controversy in the press, however was finally adopted with some modifications, and the foundation stone was laid on Armistice Day 1927. Builders for the Shrine were Vaughan and Lodge, and architect Kingsley Ussher joined the architects' practice in 1929. After completion, the building was dedicated on November 11th 1934 by the Duke of Gloucester, at a ceremony attended by about 300,000 people. Hudson and Wardrop's design for the Shrine is highly symmetrical with strong axial approaches from all directions. It drew on classical Greek sources in both form and detail and incorporated refinements to correct optical illusions, as undertaken in Classical Greece. The main form was based on the Mausoleum of Halicarnassos (353 B.C.) with a stepped reinforced concrete, pyramidal roof (originally clad externally in granite but reclad in copper sheeting in 1969) rising above a monumental cubic base. Octastyle Doric porticoes were applied to the north and south elevations, based on the Parthenon (447-432 B.C. ), and a large finial, based on the Choragic Monument of Lysicrates, Athens, was included in the final design. Together these three sources combine to produce a building based symbolically on a tomb, temple and monument. The building is planned around a central sanctuary with surrounding ambulatory, a crypt below and two balcony levels above. The sanctuary receives light from a skylight in the centre of the distinctive stepped high ceiling and a feature of the space is the ray of light designed to fall across the sunken Rock of Remembrance at 11am on Remembrance Day. The perimeter ambulatory contains ensigns and books recording the names of all 114,000 Victorian servicemen who enlisted and served in the First World War. 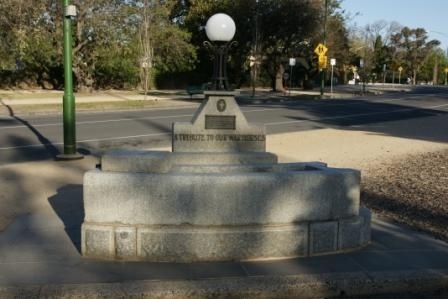 At the conclusion of the Second World War the Trustees of the Shrine took action to ensure that the enormous contributions by the men and women of Victoria to the years 1939-1945 should be likewise commemorated. 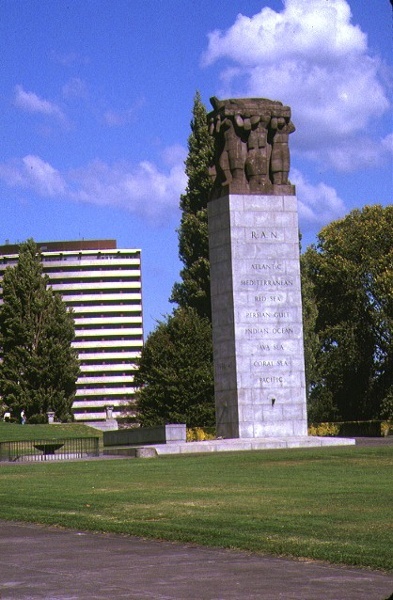 In 1949 a competition was held for the design of a Second World War memorial. This was won by Ernest E. Milston with a design for a forecourt on the northern side of the Shrine, at a terrace level beneath the existing terraces. The forecourt, dedicated by the Queen in 1954, is designed in the form of a cross, and comprises an eternal flame and cenotaph on the western arm and three flagpoles on the eastern arm. The eternal flame is a brass bowl with gas-fired flame, surrounded by a low bronze rail fence and the most substantial of the three monuments, the cenotaph, is located behind this flame. The cenotaph consists of a basalt sculpture of six servicemen carrying the figure of a fallen comrade draped in an Australian flag, set high on a sandstone base. George Allen, the head of the sculpture department at R.M.I.T. from 1933 to 1965, won a competition to design the statuary. Opposite these memorials, across the forecourt, are three simple flag poles of painted steel tube set in simple granite slabs, originally intended to be mounted in urn shaped sandstone bases. Then on 20th February 1955, the completion of the Forecourt and statuary was further marked with a special ceremony at which the Chairman of the Shrine Trustees, Lieutenant-General, the Honourable Sir Edmund Herring, KCMG, KBE, DSO, MC, ED, QC, unveiled the tablet on the Cenotaph recording the occasion. Other important elements have been incorporated into the Reserve since its inception, and a collection of these are located to the north east of the Shrine. 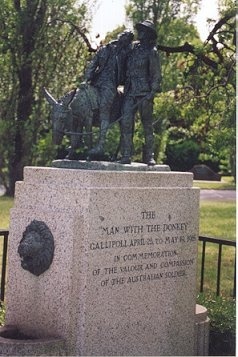 The Gallipoli Memorial, which incorporates a bronze sculpture of The Man with his Donkey, was originally located outside the Reserve in 1935, however was relocated in 1967. Located nearby is a granite horse trough, relocated in 1986 from its original position also outside the Reserve. It was erected as an initiative of the Purple Cross Society in 1926, dedicated to the welfare of the horses sent to the First World War. Also nearby are two life-sized bronze statues, Driver and Wipers, relocated from the State Library forecourt in 1998. The work of British sculptor Charles Jagger, these were originally purchased by the National Gallery of Victoria and installed after their arrival in Australia in 1937. When the project was conceived, Melbourne was the seat of Federal Parliament and this resulted in the grandest memorial in Australia, at least until the Australian War Memorial was built in Canberra in 1941. As the largest and most important war memorial in Victoria, it reflects the community's need for the commemoration of appalling sacrifice of life and an assertion of the nobility of the cause for which so many died. Its huge scale reflects the anguish of a generation. Hudson and Wardrop's design for the Shrine is highly symmetrical with strong axial approaches from all directions. It drew on classical Greek sources in both form and detail and incorporated refinements to correct optical illusions, as undertaken in Classical Greece. The main form was based on the Mausoleum of Halicarnassos (353 B.C.) with a stepped reinforced concrete, pyramidal roof (originally clad externally in granite but reclad in copper sheeting in 1969) rising above a monumental cubic base. 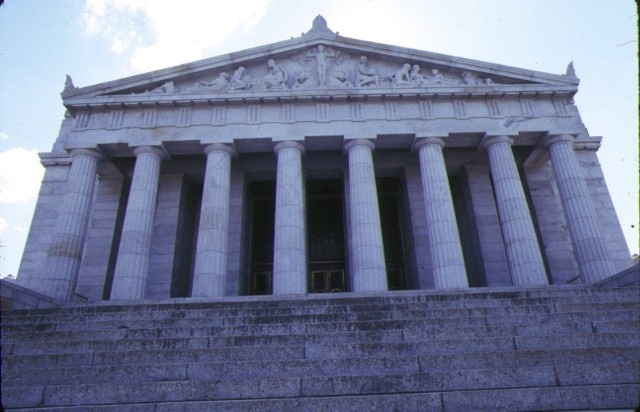 Octastyle Doric porticoes were applied to the north and south elevations, based on the Parthenon (447-432 B.C. ), and a large finial, based on the Choragic Monument of Lysicrates, Athens, was included in the final design. Together these three sources combine to produce a building based symbolically on a tomb, temple and monument. The building is planned around a central sanctuary with surrounding ambulatory, a crypt below and two balcony levels above. The sanctuary receives light from a skylight in the centre of the distinctive stepped high ceiling and a feature of the space is the ray of light designed to fall across the sunken Rock of Remembrance at 11am on Remembrance Day. The perimeter ambulatory contains ensigns and books recording the names of all 114,000 Victorian servicemen who enlisted and served in World War One.